UPDATE 11:05AM: Multiple city sources have now confirmed to CWB that the victim is Rahm Emanuel's son, Zach. Our original report from 4:14AM follows. 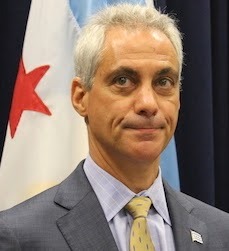 VIP treatment was extended to a male victim who got mugged just yards from Mayor Rahm Emanuel's home Friday night and there are indications that the victim is a relative or guest of the mayor. Police refused to say who had been robbed when a Sun-Times reporter inquired, but the most persistent rumor is that the victim is Emanuel's teenage son. Officers stationed outside the mayor's home reported the robbery at 9:59PM after the victim told them he had been jumped from behind by two offenders near 4200 N. Hermitage. The mayor lives at 4228 N. Hermitage. mayor—hangs over the scene of last night's robbery. CWB editors have heard Chicago police handle hundreds of strong-arm robberies in the 19th district over the past 18 months—including 2 others on the mayor's block. None drew the "special attention" of last night's incident. While most strong-arm robbery victims are lucky to get the services of more than a couple of police units, last night's victim seemed to receive luxurious VIP treatment. • Nearly 50 minutes after the robbery, a sergeant sought information about the robbery's timing. • The previously-mentioned lieutenant tried to contact the district commander to tell him about the very special robbery that had taken place. • 80 minutes after the robbery, a sergeant asked to have the offender descriptions broadcast again. • Two hours after the robbery, Sun-Times reporter Sam Charles went to the mayor's home and found multiple police units present, with a half-dozen cops talking to someone at the mayor's front door. Needless to say, cops don't usually have middle-of-the-night chit chats on the mayor's porch. CWB is aware of two other robberies on the mayor's block since last summer. Neither victim was treated to the pampering service provided to last night's victim. • On August 22 last year, a man was robbed at gunpoint on the other end of the mayor's block, at Hermitage and Cullom. • Another victim was robbed at the same intersection as last night's victim around 6AM on April 10. None of the the offenders has ever been charged. 24-hours-a-day, fully 5% of the 19th district's police manpower is committed to sitting outside of the mayor's house. Even when nobody's home. The city also installed police pod cameras at both ends of Emanuel's block after he won the 2011 mayoral election.